It took us several nights to shift and rearrange the books and soft toys onto this new Ikea bookcase. Many a times I had to adjust the shelf just to fit the varied heights of the books and magazines. Shifting one shelf requires shifting another section of the bookcase just so the bookcase won’t look so odd with mis-align shelves. 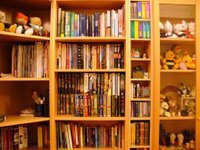 Just how I collected so many books over the years I wonder sometimes. Some of the books I never even come around to start reading. Still others were read halfway through at least! But I did managed to read and complete quite a fair bit of books and novels though. While shifting the books and what-nots, good old Casper just could not understand why we going in and out of the hall. He followed us for awhile while we sorted the books and collected from elsewhere. After awhile he just got tired out from following us up and down. Hah! Fell asleep soon after. That just fine by me. Can’t be playing with him all the time. And finally the bookcase is all done up. 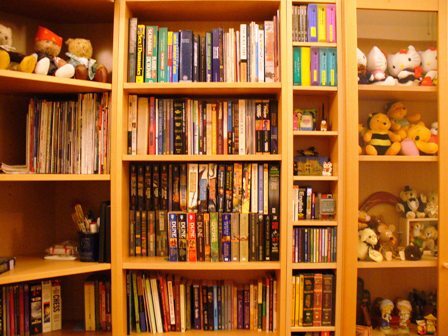 Books and magazines arranged, and the soft toys displayed. Any more books coming my way?